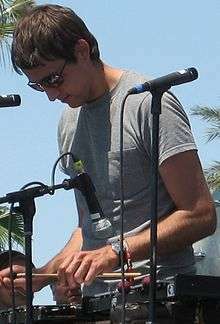 Dost performing with Anathallo at Coachella in 2007. Andrew Paul Dost (born April 10, 1983) is an American musician, multi-instrumentalist, and current member of the indie rock band Fun., in which he plays several instruments, mainly the piano. He was formerly a member of the indie rock band Anathallo from 2003 to 2007. Andrew Dost was born to father Mark Dost, a retired teacher at Frankfort High School, and mother Cheryl, also a retired teacher at Frankfort High School. Dost grew up in Cass City, Michigan and Mount Pleasant, Michigan. He graduated from Frankfort High School in Michigan as valedictorian in 2001, and graduated from Central Michigan University with a degree in journalism in 2005. Regarding Dost's musical ambitions, his father, Mark, has said, "We always encouraged it because he plays flugelhorn, keyboard, guitar, melodica and drums. And he can sing. I am so pleased and proud that he's able to do what he loves to do and make a living at it. You wonder how is this going to work out as far as making a car payment. Yet as a parent you want your child to be fulfilled." Dost is also fairly active LGBTQ+ ally, and a founding member of The Ally Coalition, an organization "that works with entertainers and their fans to raise awareness, action, and funds in support of LGBTQ equality . . ."
Dost began his musical career as a member of the band Anathallo, which was formed in 2000 at Central Michigan University in Mount Pleasant, Michigan, with Dost joining in 2003. He left the band halfway through writing album Canopy Glow in 2006; he has said that he left because the band had relocated to Chicago and he was not able to move with. The album was written, produced, and recorded almost entirely by Dost, along with help from Michael Nau (of Page France and The Cotton Jones Basket Ride), Nate Ruess (of The Format), Joel Thiele (of Anathallo), Chris Fafalios, and Steve Soboslai. The album was released in 2009 on vinyl and digital. In 2008, Nate Ruess (former frontman of The Format) asked Dost to join him and Jack Antonoff (of Steel Train) in a new band, which became Fun. Dost already knew the two, because their former bands had toured together. While making Fun. 's first album, Aim and Ignite, Dost remained based out of Michigan, while Ruess lived in Phoenix, Arizona, and Antonoff in New Jersey. Fun. 's second album, Some Nights, saw the band's first #1 hit single, "We Are Young", which Dost co-wrote with Ruess, Antonoff, and Jeff Bhasker, the band's producer. Dost also created an original score for the beginning of the "Carry On" music video in 2012. He composed the soundtrack to the movie The D Train, released in 2015. The soundtrack contains a collaboration with his Fun. bandmate Jack Antonoff. In late 2015, Dost has mentioned that he hopes to release new music soon. In this same interview, Dost also said, regarding his music, "I'm pretty heavily influenced by '60s pop, but also love experimenting with modern sounds. I like the Beatles, I like musical theater, and I like Drake." On April 26, Dost performed a new song titled "Where Did They Go". Dost will be performing "Where Did They Go" along with an unreleased song titled "Young Republicans" at the Detroit Music Awards on April 29. These songs have not been released officially as singles. Aim and Ignite (2009) with Fun. Some Nights (2012) with Fun. Wikimedia Commons has media related to Andrew Dost. 1 2 3 4 5 "Sebastian Murdock, "Profile: Andrew Dost", CUIndependent.com, Oct. 4, 2010". Cuindependent.com. Retrieved 2013-12-04. ↑ Photo Courtesy Atlantic Records - Lyndsey Byrnes (2012-11-08). "Tiffany Bentley, "Fun. 's Andrew Dost talks about success and the superstorm", lehighvalleylive.com, Nov. 8, 2012". Lehighvalleylive.com. Retrieved 2013-12-04. 1 2 3 DRAHOSmdrahos@record-eagle.com, MARTA HEPLER. "Frankfort native is having 'Fun.'". Traverse City Record-Eagle. Retrieved 2016-02-18. ↑ STANTONastanton@record-eagle.com, BY ANNE. "Frankfort native has 'fun.' in the spotlight". Traverse City Record-Eagle. Retrieved 2016-02-18. ↑ "K.O.A. Zine -- Anathallo Interview". www.koarecords.com. Retrieved 2016-02-18. ↑ "Andrew Dost: Seeing a new city through the eyes of a local". static.record-eagle.com. Retrieved 2016-02-18. 1 2 "Fun. Member On Why Gay Issues Are Near To His Heart". The Huffington Post. Retrieved 2016-02-18. ↑ "The Ally Coalition on Instagram: "@andrewdost sighting, I repeat, dost sighting."". Instagram. Retrieved 2016-02-18. ↑ "INTERVIEW: Fun. Keyboardist Andrew Dost Talks 'Glee,' GaGa, and LGBT Issues". ralphieaversa.com. Retrieved 2016-02-18. ↑ "The Ally Coalition". YouTube. Retrieved 2016-02-18. ↑ "Profile from". lastfm.com. Retrieved 2013-12-04. 1 2 "James Montgomery,"Fun. Find Breakout Anthem With 'We Are Young'", mtv.com, Feb. 21, 2012". Mtv.com. 2012-02-21. Retrieved 2013-12-04. ↑ "Andrew Dost on Twitter". Twitter. Retrieved 2016-02-18. 1 2 Staff, M. T. "Watch out! Here come the 25th annual Detroit Music Awards". Detroit Metro Times. Retrieved 2016-04-28. ↑ "Music Monday: Andrew Dost of fun.". WDIV. 2016-04-25. Retrieved 2016-04-28. ↑ "Tom Eames, "fun. hold off The Wanted to score first UK No.1 single", digitalspy.com, May 27, 2012". Digitalspy.co.uk. 2012-05-27. Retrieved 2013-12-04. ↑ "Official Charts Company". Officialcharts.com. 2012-10-06. Retrieved 2013-12-04.